Unique Silver Heart Necklace For Women : LOVE2HAVE in the UK! 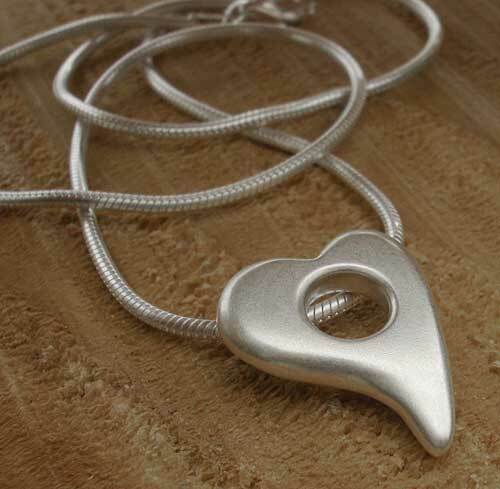 A unique silver heart necklace for women. This particular piece of jewellery is the necklace that matches the unique sterling silver heart bracelet. The heart this time is threaded onto a silver snake chain. It measures approximately 2cm x 1.7cm, and the snake chain is about 16 inches in length. Other lengths are available on request. The heart has a smoothly rounded edge styling to it giving it a sleek designer look. An elegant heart-shaped silver necklace with contemporary designer styling that women love. 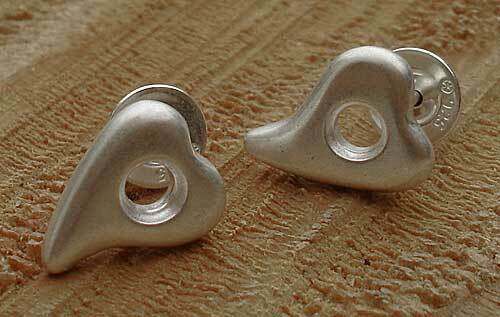 The heart has a matt satin style quality to the finish giving it a softer look. It is the attention to shaping and quality that makes this piece a very particular and unique gift. Matching stud earrings also pictured.